God's Lake by Castereigh Theatre Project January 4-6 2-18. A Preview. You are here: Home / Arts / God’s Lake by Castlereigh Theatre Project January 4-6 2018. A preview. God’s Lake by Castlereigh Theatre Project January 4-6 2018. A preview. However, I am making an exception for God’s Lake, produced by Castlereigh Theatre Project and appearing at the Metro Studio Theatre January 4-6 2018. 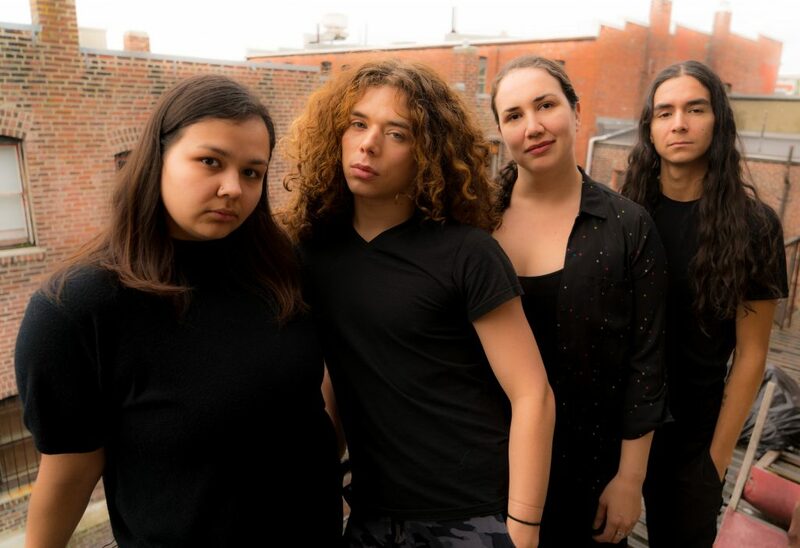 Due to its very nature—documentary theatre—and the topic—the safety of young Indigenous women and girls living on isolated First Nation reserves—this production will be riveting, and is worthy of any discerning theatre-goer’s attention. Castlereigh Theatre Project was founded in 2007 by brother-sister duo Francesca Albright and Jude Allen for the express purpose of writing their original documentary theatre piece Castle in the Sky–last seen in Victoria in 2016–based on the tragic 2006 murders in Medicine Hat Alberta of three family members by their 12 year old daughter and her much older boyfriend. In between they’ve written Ocean Fox about a Bahamian dive master and The Dublin Play. God’s Lake, by Albright with award-winning filmmaker Kevin Lee Burton, who hails from the fly-in community of God’s Lake Narrows, was inspired by the mysterious death of a young Cree woman. Albright followed a thread from a CBC article about the homicide to discover Burton’s interactive film about his home community. One thing lead to another and soon they had agreed to collaborate on this project. “We’ve been non-stop since”. In all, Albright and Burton made three trips to God’s Lake to conduct hundreds of hours of interviews with members of the community. God’s Lake (population 1800) is a dry reserve, 450 kilometres from Winnipeg, accessible by air or winter road only; in addition to the reserve there is also the provincially operated “island” where the health clinic, school and RCMP detachment are located, as well as the Métis town. Leah Anderson’s homicide in 2013 lead to several arrests, but no convictions. Four years later, there were many unresolved issues in the community. The playwrights are quick to point out that this is not a “whodunit” but rather, an exploration of a very complex issue and an attempt to humanize the process for people who might have no understanding of the reserve system, let alone what it’s like to live on a remote First Nations reserve. “Kevin didn’t tell me anything. I was an outsider who knew nothing about nothing,” says Albright. During the course of their investigations, the pair ignited interest in the murder again. They spoke with the RCMP (who have a detachment in God’s Lake Narrows) and even Sheila North, grand chief of the Assembly of Northern Manitoba First Nations. Director Britt Small believes, with the recent Murdered and Missing Indigenous Women Inquiry, and many conversations stemming from Canada 150, that there is a renewed awareness among settler Canadians. “It’s time to shine a light on systemic issues and to listen for a while”. Focusing on the words of people living in God’s Lake Narrows, Castlereigh will do just that. In speaking with dozens of people over six months, they encountered the frustration of residents. “Imagine the intense feeling of not knowing, the rumours and the secrets, how frustrated people are at a lack of resolution; the sense they have of being abandoned” states Burton. “Everybody wants to know, but nobody knows”. Working with a cast of four— Nick Benz, Nyla Carpentier, Taran Kootenhayoo and Erica Wilson—who will play multiple roles, this workshop production is the first step in development that will hopefully lead to God’s Lake being produced across the country. Here’s a unique opportunity to witness the beginnings of a new work that will open new conversations for people, and lead to a better understanding of complex and systemic issues, seen from the observations of those living inside the system. Directed by Atomic Vaudeville’s Britt Small. Dramaturgy by Gordon Pengilly. Production Design by James Insell. Projection Design by Guy Segal. Lighting Design by R.J. Peters. Featuring: Nick Benz, Nyla Carpentier, Taran Kootenhayoo and Erica Wilson. Nick Benz is an artist with Croatian, Irish and Mi’kmaq ancestry. Nick grew up in Ontario playing sports, riding horses and doing musical theatre but after high school decided to move to New York City to pursue dance. In the city Nick’s studies focused on Hip-Hop, Vogue and Caribbean culture/dance. Some of Nick’s credits in NYC include horseback riding for The Metropolitan Opera and various commercials. Nick is now involved in various local Vancouver theatre and dance projects and is a certified Gyrotonic(R) instructor with a special interest in physical therapy. Nyla Carpentier (Tahltan, Kaska, French, Scottish) is a multifaceted performing artist currently residing in Vancouver. She is a poet, a powwow dancer and workshop facilitator. As an actor, Nyla toured in the theatre for young audience show Raven meets the Monkey King with Axis Theatre and performed with Savage Society’s productions of The Boy who was Abandoned and Battle of the Birds. She was in The Flats/Les Flats by Ginny Collins, a co-production with Prairie Theatre Exchange and Theatre Cercle Moliere in Winnipeg, Manitoba. This past summer she was at the Blyth Theatre Festival in their production of The Berlin Blues by Drew Hayden Taylor and Ipperwash by Falen Johnson in Blyth, Ontario. Taran Kootenhayoo is a Denésuliné and Nakoda Sioux actor, spoken word poet and playwright. Born in Cold Lake, AB, he is now based out of Vancouver, BC. He received his Acting for Stage & Screen diploma from Capilano University in 2015, is signed with Premiere Talent Management, and is in Full Circle’s First Nations Performance Ensemble. Past written projects have included work with the SOAR Aboriginal Arts Program, Cuywsti and Tom Cone’s Sacred Space Festival. Erica Wilson is an Metis/Anishinaabe emerging artist in the Winnipeg theatre community, starting with theatre classes at Manitoba Theatre for Young People and its former Aboriginal Arts Mentor-ship program. Erica is now a current student at the University of Winnipeg taking her studies of theatre a little further, Erica has worked with several theatre companies including Urban Indigenous Theatre Co, Sarasvati Productions—where she has recently been on tour with their mental health project Shattered, and in Two Indians for their FEMFEST 2017,— Vault Projects Riot Resist Revolt Repeat and Royal Manitoba Theatre Centre assisting directing Sarah Ballenden. Erica has also been involved in reconciliation work with Canadian Roots Exchange as a youth Initiative 2014 in providing workshops in Winnipeg.